Nothing is more frustrating than waiting for a website to load. The uninformed visitor might blame their internet provider, but more often than not it’s the fault of the website for not being considerate of their userbase when designing their website. Optimizing your website has always been a staple of website ranking in popular search engines like Google and Bing. Without proper optimization, your site can suffer in ranking due to slow page loading due to size and resources. Luckily, there are many ways to decrease load time on your site – many of which are free – that website owners can take advantage of in the online space. The four that we will talk about are website cache, reducing image size, minifying scripts, and content delivery networks. What can you focus on when building your site to ensure page speed is up to snuff? 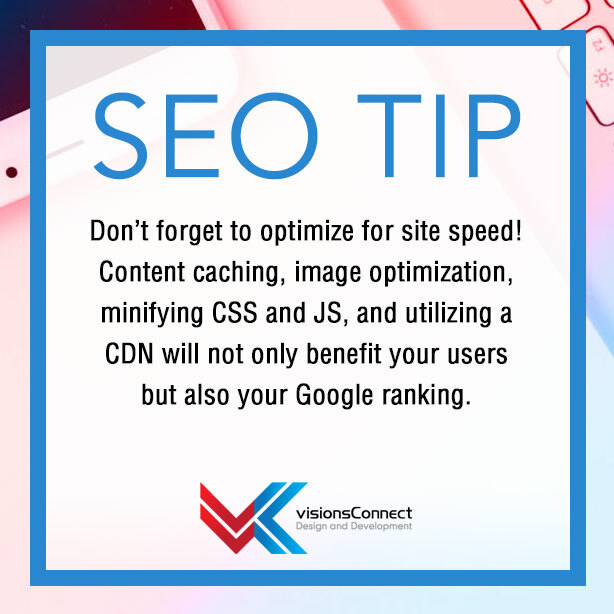 Follow these tips to speed up your website! Many CMS offer cache plugins that can make setup a breeze. We recommend WP Fastest Cache but there are many others that will also serve your needs. Everyone loves a large eye-catching image to grab attention. Unfortunately, those flashy images also take up a large amount of space that has to be sent to your visitor when they request a webpage. Even if you output images from Photoshop with filesize in mind, there is still more optimization to be had. The technique of smart lossy compression reduces the amount of color data that may be inside your image, along with any unnecessary meta data. One way to check if optimization is needed is by using Google’s PageSpeed Insights which tells you which images can be shrunk further. Our favorite way to optimize images is TinyPNG. It is free for use in small batches of images but they also offer a paid WordPress plugin for bulk images, a Photoshop plugin, and even an API. CDNs are used by the biggest sites on the Internet, especially social networks like Facebook, Instagram and Twitter. Let’s explain how they work! A website needs to send out large amounts of similar data to its users spread out across the globe. They may have one or two servers in one geographic region that contains these files but some of their website visitors are not close to these servers and when that data needs to be served, latency (slowness) occurs due to the distance between. Content Delivery Networks work by having many servers spread across many regions so that each user will connect to the closest server to them so that less time is needed to receive the full request. Many companies offer CDN services including Microsoft, Akamai, and Rackspace. There is an added cost involved but the benefits are great as search engines rank on page speed not only in your geographical region, but everywhere across the globe.